Nutritional Therapy is based on the philosophy that the myriad of health problems plaguing modern society result from weaknesses in the body’s physiological foundations brought on by poor nutrition. Nutritional Therapists offer a holistic approach to nutrition incorporating specific tools for assessing the body's nutritional deficiencies using the body's innate intelligence, and how to address those weaknesses through a properly prepared, whole foods diet, supplementation, and lifestyle changes. We embrace bio-individuality and believe that each person is unique and we take the time to personalize a program for your individual needs rather than taking a one size fits all approach. Initial Interview - I conduct an in-depth review of your health history, lifestyle, concerns, and short and long-term goals. Food Journal - You will be asked to complete a 3-day food journal. I assess food quality, quantity, potential food allergens, excess diuretic consumption, hydration, and macros. Actionable steps toward improvement are provided so that you can make changes as easily as possible. Nutritional Assessment Questionnaire (NAQ) - You will complete a detailed, 300 question online survey to identify potential nutrient deficiencies and imbalances in organs and systems. Functional Evaluation (FE)* - A unique, hands-on evaluation technique in which I will palpate a series of points on the body correlated to specific organ systems. The points provide feedback from the body to determine where dysfunction and nutritional deficiencies are occurring. Many of the functional points I perform are based on neuro-lymphatic pathways that are actually Chinese acupuncture and acupressure points. The points become symptomatic when the lymphatic tissue shows congestion. This congestion is very tender to the touch. I will be able to "feel" this congestion upon functional assessment and you will feel the tenderness. Handouts, meal plan/recipe ideas, book recommendations, websites, etc. Next steps - short and longterm goals. Is Nutritional Therapy Right for Me? Yes! 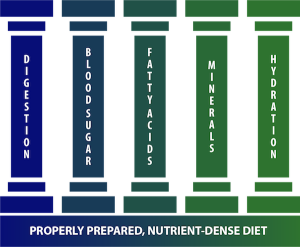 Everyone needs Nutritional Therapy! The only thing I ask of my clients is a willingness to implement changes in their diet and lifestyle. You have to put in the work to see results. There's no magic potion! Note: NTPs do not diagnose or treat pathological conditions, injuries, or diseases. Rather, we support the foundations and root causes resulting in balance within the body.